We have been moving right along with our bathroom makeover. It's almost time for me to do the part I love best, decorating and organizing everything! Thankfully the floor has been replaced and the leak has been fixed! Now we are putting everything back together. I love the look of bead board and chair-rail in a bathroom. 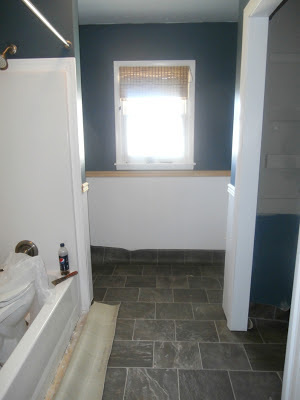 I think it makes a small bathroom look and feel larger, especially when painted a bright white. Here is a pic a snapped during the process of hanging the bead board. Notice our new, not rotten anymore, sub floor!!! After this was complete I painted everything. It was way easier to paint before the new vinyl went in. 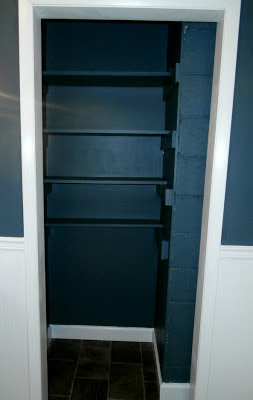 I chose Relaxed Navy by Valspar. It gives the moody feel I was going for. I went with the navy instead of gray to change things up a bit. I was tired of looking at our previous gray walls. 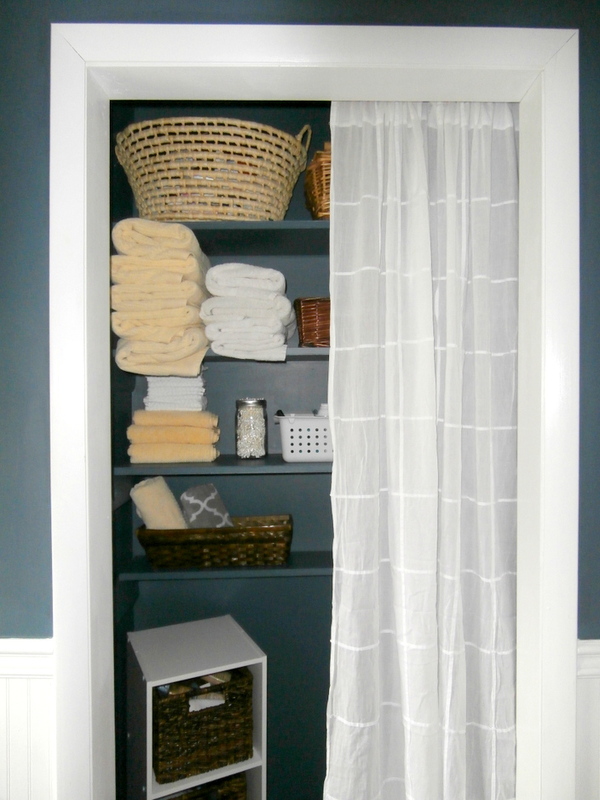 The bright white bead board helps the dark wall color not feel too overwhelming. Yesterday the vinyl floor went in. I know vinyl is not usually the route people go. Most people choose tile, but I'm not a fan of tile. I think it's cold, hard, and not very kid-friendly. Boo-boos hurt more when a tile floor is involved! 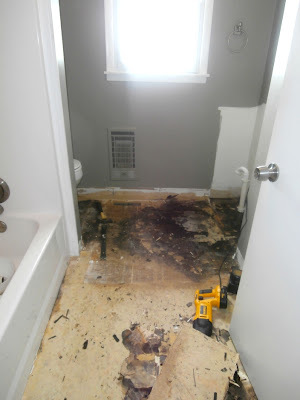 I think tile floors are beautiful to look at, they are just not the right choice for us. Vinyl has actually come a long way in recent years. The one we chose for our bathroom is the same as the one we have in our kitchen. It's super thick and durable, but it's also very soft to walk on. Best of all, it's very easy to clean!!! When people come over they actually have to bend down and touch it to see that it's not tile. 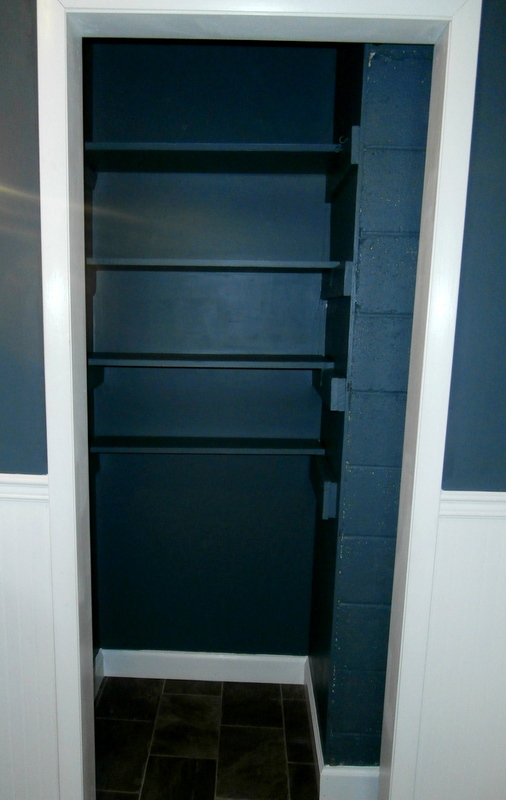 We have a nice sized closet in our bathroom for storage. I removed the door a while back because it was constantly getting in the way. It functions much better with a curtain instead. I filled the closet with our towels, washcloths, and toiletries. Baskets help keep like-items grouped together and add a little texture. The little white shelf was $12 from target. The baskets were also purchased at Target and hold my many products. I'm such a product junky. I know that's bad! I'm working on it! Here is a shot that shows more of the bead board. Doesn't it really open up our small bathroom? 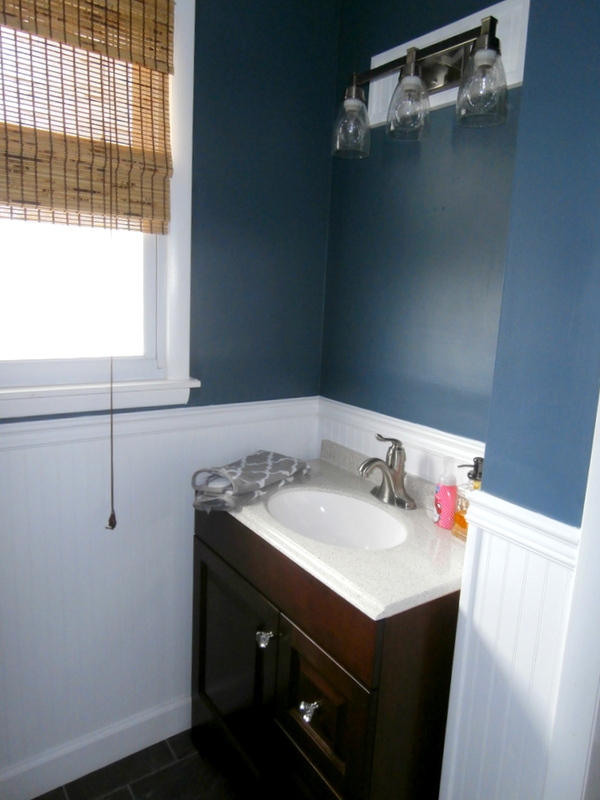 We chose a larger vanity to fill up the nook, and added a three-light fixture. The vanity top was included with the cabinet. I already love having more counter space in here! It makes such a huge difference. We still need to do a few more finishing touches before I can focus on decorating. I'm still undecided about that. I need to pick out towel bars, etc. I'm trying to decide if I should go with open shelving above the toilet or some kind of cabinet. 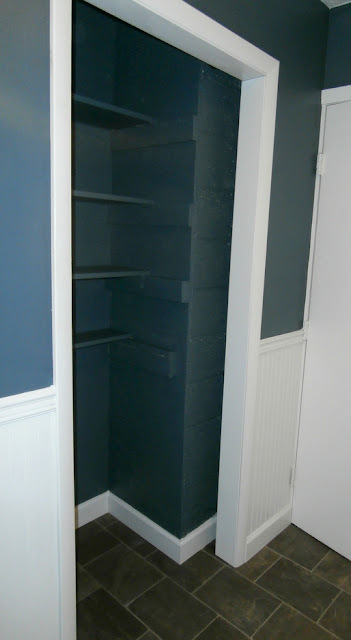 Would open shelving be too much since the closet it sort of open shelving? I'm not sure. So that's where we are as of today. I'm so thankful to have a functioning bathroom again! I hope to share a full reveal with lots of details next week! It is BEAUTIFUL!!!! WOW! What a stunning transformation! 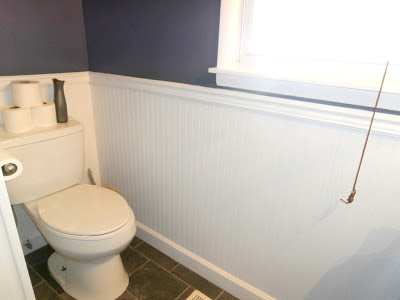 Ok...I couldn't exactly see the location of the toilet but I'm thinking open shelving would be awesome there! Great work and have a wonderful weekend!! Thank you! 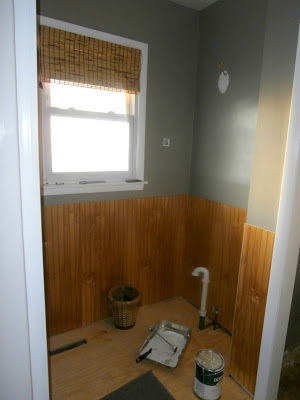 The toilet is directly across from the sink...it sort of hides behind the little wall. I may go ahead and give open shelving a shot there! Thanks for your comment! Leah this is cute & I LOVE the paint color!